Amid the economic, political, and social collapse, Brazil has been described by many as being in the midst of a “zombie apocalypse” as years of corruption and violence spectacularly implodes all at once. Horrified by the out of control violence and pessimistic about the nation’s political and economic outlook, thousands of wealthy Brazilians are now fleeing the country. Thiago Lacerda, a high-profile actor, is one of the thousands of celebrities, bankers, lawyers and affluent Brazilians considering emigration before the next round of turmoil. “I’m totally freaked out by what’s been happening, especially here in Rio [Rio de Janeiro],” Mr. Lacerda told The Wall Street Journal. Naercio Menezes Filho, director of the center for public policy at Insper, a São Paulo business school, commented on the situation and pointed out — the elite fleeing the country is the newest trend amid the threat of gang violence and economic instability. 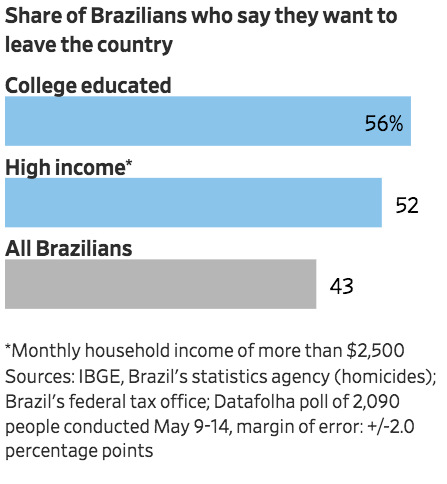 According to a study published in June by Brazilian polling agency Datafolh, about 52 percent of the wealthiest Brazilians — those with a monthly income of more than $2,500 — want to emigrate, while 56 percent of college graduates have plans on leaving the country. “The hope that Brazilians once had in their country has gone out the window, and many people are now reaching the conclusion that things are unlikely to change in the next few years,” said Mr. Menezes Filho. 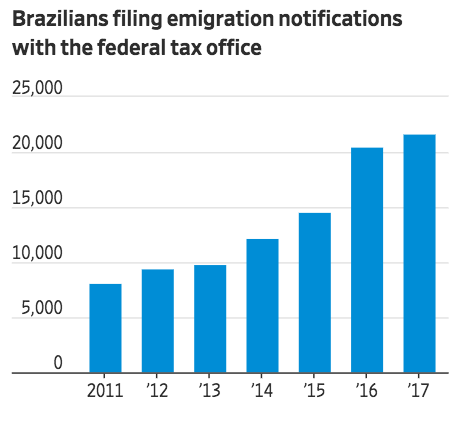 Government figures show the number of Brazilians filing emigration notices with the federal tax office reached 21,700 in 2017, that is nearly three times the number in 2011, when officials started recording the data. WSJ notes that many are moving to the Portuguese Riviera and to US cities such as Orlando and Miami. 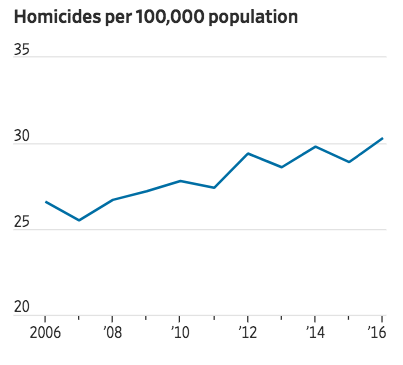 Since the economic collapse, Brazil’s murder rate has been increasing. The response: Emigration notifications with the federal tax office explode higher. And now, the country’s elite want out. Marcelo Caio Corrêa de Melo, a 37-year-old e-commerce manager in Brazil, told WSJ that security is the top reason he is emigrating to Portugal at the end of this month with his wife and two children. “At the beginning of this year, I was in the office and suddenly we heard a huge explosion outside, and everyone jumped up,” he said. “It was a grenade let off by criminals running from the police.” A few months later, he said his father was robbed at gunpoint — and that is when he decided to escape the collapsing country. According to Datafolha, the economy could grow at a 1.5 percent pace this year, while unemployment remains elevated at 12.4 percent. Datafolha asked 16- to 24-year-old Brazilians would they emigrate, and the result was shocking: 62 percent said yes. Besides violent crime and a collapsed economy, 16- to 24-year-old Brazilians may want to flee the country because of high taxes, stifling economic growth as a huge chunk of which goes to pensions, said Tony Volpon, chief economist at UBS in Brazil. For those with a good education, leaving “looks like a good decision,” he said. WSJ cites Brazil’s foreign ministry, which indicates the US has the most significant share of Brazilian expats — more than a third of the three million Brazilians estimated to be living abroad. “Things just work there. Infrastructure is better, and everything is not so expensive,” said Vinícius Barbosa da Silva, 20, a student from the south of Brazil who said he is preparing to migrate to the US by 2020. Joseph Williams, a US entrepreneur who moved to Brazil eight years ago, said some Brazilians cannot comprehend why he is still transacting business in the country. “I tell everyone who comes to Brazil that if someone comes at you with a gun, you give them what you have,” he said. Recently, in São Paulo, where he runs a real-estate advisory and investment firm, two men robbed the occupants in the car next to his at the traffic lights. “I threw my phone and my bag on the floor and slid down on the seat,” he said. But for many Brazilians, leaving the country has become more appealing. “I want to give my kids a childhood, more freedom, more equality,” said Lacerda, the famous actor, adding that “the idea of cutting myself off from my country is unthinkable,” however, necessary as the country descends into further chaos.